November 27, 2015 zoomvroom Car Culture, Random, The auto dictionary. Look it up here! Not the best shot, but it was one of the few that didn’t include fire or tire smoke. Racing a car or a motorcycle, while fun, is never quite safe. If you do it long enough, you will surely find yourself taking a vacation off the pavement. Before you end up hitting a tire wall or get your roof sanded off when you flip, you should know what to do in the event of a crash. This also applies to if you’re driving around in your daily life. Stop the car as quickly as you can! If you’re in a drag car, pull the parachute or floor the brakes if you don’t have a chute. 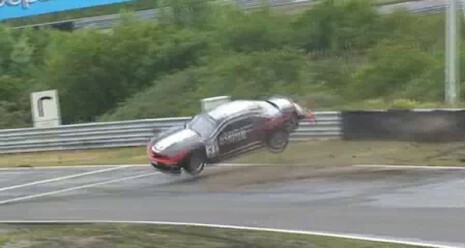 If you’re in a road course car, floor the brakes. If you know that you can’t save it, you might as well crash as slowly as possible. Brace your head against the head rest. Pull your thumbs away from the steering wheel so if it kicks back at you when you land or stop, you won’t have reshaped your knuckles. As the dust settles, take a deep breath. Can you still breathe? If you can, awesome! Figure out where you landed, but you should figure out if you are on fire first. Normally, the safest place to be is in the car, unless you are on fire. Then you want to get the hell out of your car. If you aren’t on fire, you still have some choices. If the car is still moving, or able to move, try and get it off the track, or to a corner stand where a corner worker can help you out. If the car can’t move, cut the fuel and power, and wave your arms around so safety personnel know you’re alive. If you decide to drive the car off the track, make sure you don’t dump fluids all over the track. Watch your gauges, check your mirrors for smoke and other cars, and if you have a sneaking suspicion that something is going to leak or drag, just wait for the safety crew to come to you. Stay off the racing line or dragstrip groove if you can. Off the track, things can be just as hard. You might have had a bad crash, but thankfully not bad enough to send you to the hospital. Somehow, the track crew was able to extricate your car from the catch fence or tire wall. Watch them if you can, so they don’t cause further damage. That sounds silly, I know, but it will be easier on you if you can rebuild the car. People don’t come to racetracks expecting to crash. Most tracks will allow owners to store the car for up to a week if need be. While all tracks are different, that’s usually what you can expect. For the most part, the track will cover the cost of repairing the broken tire wall or whatever you hit. Yes, it can be rough, but gather any in-car video or data and go home. The big decisions will come the next morning. Expect to be sore the next day. Many people have more than just money poured into their race car. Damaging or totaling a car can feel like losing a dear friend or a family member. I know this because I still dearly miss my minivan. Just know that beating yourself up won’t fix the dents. Get out into the garage or driveway and take stock. If it’s just body damage, you can get back onto the track in a couple of weeks. If you damaged the chassis or suspension, you might want to look into a new car. Suspension can get replaced, but it can cause massive problems with the chassis. Depending on the value of your car and the frequency of your racing, check out racing insurance before you have to do a full rebuild. Many racers say that the best way to get over a crash is to win the next race. It will remind you just how much fun it is to race. Just get out on the track and have fun. Many people like to own cars that are beautiful and naturally garner attention. They drive cars like Aston Martins and Jaguars. There are also a lot of people who can’t afford cars like those, but still want their cars to grab attention, so they drive cars like Subaru WRX STI’s and Ford Mustangs. Those cars are loud and proud of it. They grab attention through their noise. It just comes down to a matter of personal choice, and that’s fine. Many people really like having a car that has great performance, but doesn’t attract throngs of people and law enforcement. Their cars of choice are seemingly Plain Jane cars on the outside, but that doesn’t mean that their performance capabilities are any less than something like an STI. Here, in no particular order, are the absolute best sleepers that have been sold here in the past 25 years. GMC Syclone/Typhoon: Some of my readers grew up in the 1990s. It was a technological revolution, and also a time of rebellion and shattering societal norms. GMC’s decision to build the Typhoon and Syclone was probably one of their best. 280 horsepower isn’t very much horsepower for a truck, but all the way back in 1991, it meant 60 mph in five seconds. That’s right on pace with a modern Chevy Camaro and Ford Mustang. Thank the 350 lb-ft of torque and the AWD system for that. Most people won’t know what they are looking at. They will see an old truck or SUV that is pretty darn small. That punk in the Honda Civic next to them will have no idea that it will blow his doors off at the stoplight. Trust me, you’ll have to have a bona-fide performance car to beat a Syclone or Typhoon in a drag race. Plus, they are very reliable – Jay Leno daily drove one for years without any problems. One of the most legendary trucks, let alone sleepers, of all time. It looks so innocent! 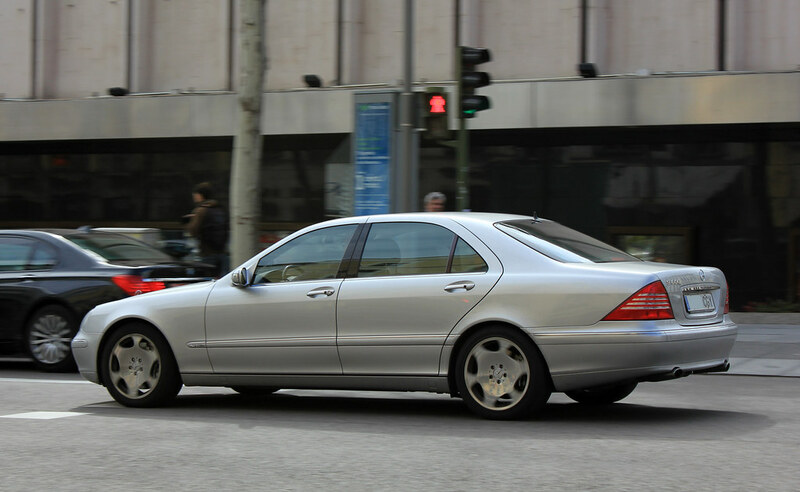 Mercedes-Benz S600: Even people who know nothing about cars know about the Mercedes-Benz S-Class. They know it’s expensive and luxurious, but nothing past that, really. Most people probably wouldn’t even notice the W220 (chassis generation, just like people know generations of the Ford Mustang as the Foxbody, the SN 95, the S197 and S550) anymore. It still looks dapper, but at this point, it’s generic enough that it flies under the radar with ease. Only us car people will know what they are looking at. Any S600 is going to be quick, but the 2003 update made it something fearsome. The 5.5-liter twin-turbo V12 snarled out 493 horsepower and 590 lb-ft of torque. It’s the banker’s hot rod, just like the Hudson Hornet was in the 1950s. Oh, and if you put a straight piped exhaust on the S600, it sounds like a Formula 1 car. While it still looks nice, the average person would brush it off as just another Mercedes-Benz. However, any Mercedes with these wheels will blow the doors off of just about anything. Volvo V70 R: Station wagons haven’t been the preferred method of kid schlepping in many years, which is a true shame. Even when they were popular, they weren’t cool. Any station wagon that has a Volvo badge on it is going to be recognized as safe, but nobody ever drives a Volvo aggressively. Now, chuck all of what I have just said out of the window. Never think or speak of it again. The Volvo V70 R had an inline five cylinder engine that cranked out 296 horsepower and 295 lb-ft of torque that went to the wheels via a Haldex AWD system. It hit 60 mph in under six seconds, which made it ideal for the dad who wanted a Mazda Miata with room for his wife and their kids and dog. 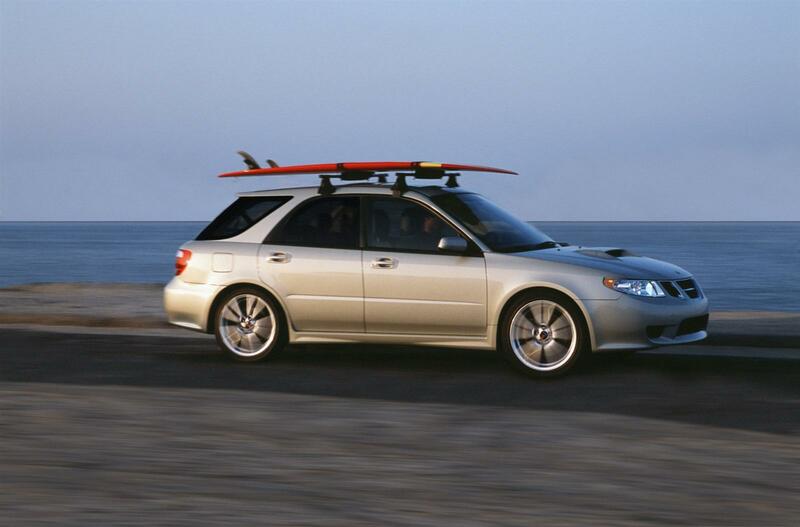 Saab 9-2X Aero: While the Subaru WRX is a great car in it’s own right, it’s the exact opposite of a sleeper. It’s loud and it attracts more attention than the cute girl in high school. 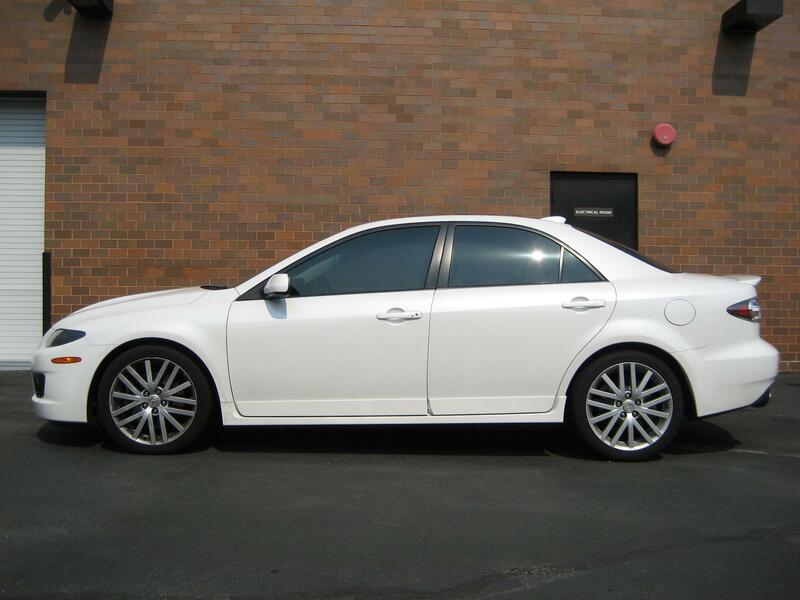 If you liked how the WRX drove, but wanted something more toned down, look no further than the Saab 9-2X Aero. It used to be that there was no option like the Saab 9-2X Aero. Then some brilliant mind at GM decided that they needed to dive into the compact luxury car market. The result was the Saab 9-2X Aero. It was based off of the WRX, but the interior was much more premium, the car wasn’t nearly as loud, the looks were toned down, but at heart, it’s still a Subaru WRX. It’s just a luxurious Subaru WRX. It’s really compact, which is great if you live in a city. Mazdaspeed 6: In the midsize sedan segment, many cars will put you straight to sleep. The Mazda 6 has never been one of those cars, and as such, is always my first suggestion for a family sedan. Even though it’s fun to drive, it’s still nothing special at the end of the day. However, Mazda decided to throw practicality and sensibility out the window. They handed a Mazda 6 over to the brilliant minds over at Mazdaspeed, and let them work their magic. The result was a 270 horsepower, turbocharged, AWD sedan with a six speed manual. Pure brilliance. It could hit 60 mph in under 5.5 seconds, yet looked like an average Mazda 6 to the untrained eye. And yes mom, it still has all the practicality of a family sedan. It just happens to be far faster than any other family sedan. It looks like just another family sedan. However, anybody who has read this post knows what’s up with this car. Chevrolet Cobalt SS: The Chevrolet Cavalier was a truly terrible car. While it’s replacement, the Cobalt, was a vast improvement, it wasn’t a good car by any stretch of the imagination. It was an inexpensive car that catered to those who needed a brand-new economy car despite the fact that a three-year-old Toyota Corolla was a much better car. It sold well. Chevrolet somehow managed to redeem the Cobalt. The Cobalt SS was probably one of the greatest pocket rockets to ever race around. It was unexpectedly fast, and incredibly adept on any race course or autocross course. A 205 horsepower version came out first, but the real gem was the 260 horsepower turbocharged version. Even with a gigantic rear wing, nobody expects a Chevrolet Cobalt to be that fast. One way to make it even more of a sleeper is to remove the wing and put on non-SS Cobalt wheels. Talk about a sleeper of epic proportions! It looks like just another Chevrolet Cobalt, but with big wheels. Acceleration is best achieved by flat-footing it (where you keep the gas pedal planted, and shift without lifting). Ford Taurus SHO: While the original Ford Taurus was a great car, the original Taurus SHO (Super High ) is a legend in the performance sedan world. The current generation does not look at all like a performance car. It’s a comfortable cruiser and a good police car, but it looks like nothing special. Part of what makes the current SHO such a sleeper is that the automotive press basically wrote it off when it was introduced. Even in the SHO trim, it’s meant for being an effortless cruiser, not a canyon carver. This doesn’t mean that you should try and do a stoplight drag race with one. An SHO can hit 60 mph in just over five seconds to 60 mph. 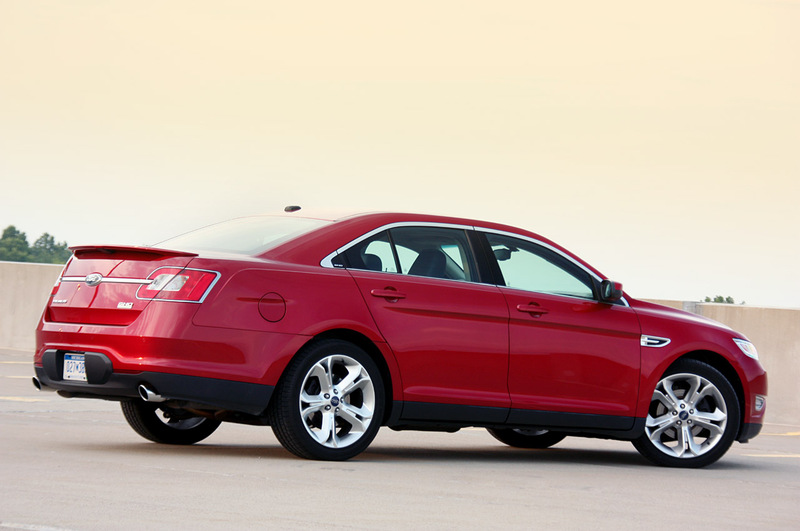 If you’re a fan of fullsize sedans and the word stonking fast, look into getting a Ford Taurus SHO. Chevrolet SS: Even though this is a list of sleepers sold in America over the past 25 years, the Chevrolet SS truly deserves to be on the list of all-time sleepers. How many cars can claim the accomplishment of having basically nobody know they exist? While some reviewers would consider it a flaw that the SS blends in with all of the boring cars, it’s actually a good thing. 99% of the people you pass in the SS will think it’s a Malibu, if they even notice it at all. They are wrong because it has a 415-horsepower Corvette engine, a six-speed manual and a magnetic suspension sourced from the Corvette. It’s the car that’s so anonymous that no cop will pull you over. Really looks like nothing, doesn’t it? Here’s to hoping that the FBI has good taste in cars and starts using these!